We are a small business dedicated to customer satisfaction, repeat business and professional cleaning . Professional Cleaning of roofs removing moss, algae, and black stains from your roof, making it look like new again. We specialize in cedar shakes but we’re able to handle all roofing materials. Keeping Mother Nature in mind, our cutting edge roof cleaning method uses only biodegradable solutions. 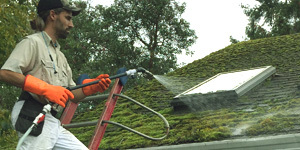 We use a gentle non-pressure wash method which keeps algae and moss from coming back for years, and protects the integrity of your roofing materials. Professional Interior, exterior, commercial and residential window cleaning. We can get that beautiful view back again. Post-construction, tough residues, difficult to reach windows are all possible with our many tools and tricks to the trade. Shawn has over 20 years of experience washing windows and has it down to a fine art. Make your sidewalks, paths or driveway look new again. For softer, delicate surfaces and mold infestations we use low pressure, solution based applications. 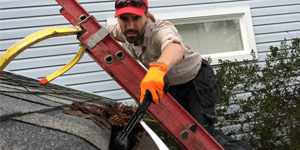 Gutters benefit from regularly scheduled professional cleaning, which we can provide. Overflowing gutters are something we can fix for you. We clean interiors and exteriors of gutters for looks and proper drainage. Leak repairs, downspout upgrades, gutter guard installs are services we offer to help prevent overflows and damage to your property. 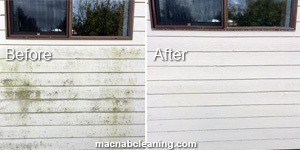 From pre-painting to the toughest house and building washings, we professionally clean a wide variety of siding and exterior surfaces.